So…you can tell what kind of a week I have been having by the posts I share. This week has been a tough one for a few different reasons. Like I mentioned before, I fell off the food allergy wagon…but I picked myself up off the ground, dusted myself off, and am working on climbing back on. I was also sick yesterday, which is why there was no post. I spent my working time in bed asleep! In my self pity I decided to try a recipe I had been given from my friend Stacy who swears that these are THE. BEST. CHOCOLATE. CHIP. COOKIES. EVER! Since I was already off the bandwagon, I thought…why not take the challenge and see if these cookies really are the best chocolate chip cookies. And since my daughter has been wanting to bake goodies for my blog, it was the perfect recipe for her to bake up. 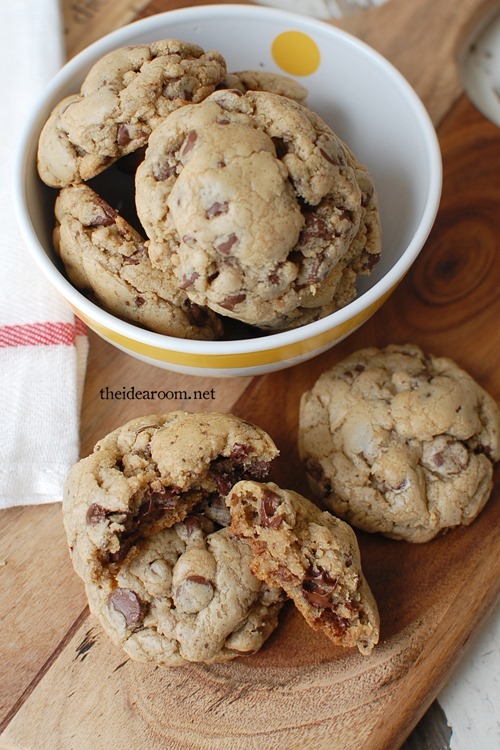 You guys…these are good and dare I say it…one of the best Chocolate Chip Cookie Recipes I have tried. I think they are my new favorite…now I just need one of you smarties out there to turn this recipe into a gluten free version since I am getting back on the allergy bandwagon. Cream together butter and sugars till smooth. Add the rest of the ingredients one by one and mix well. Scoop into balls on a greased cookie sheet. I like to use a medium ice cream scoop so the cookies come out the same size. I would love for you to try these out and add your own vote as to whether they are your new favorite Chocolate Chip Cookies!! Better stock up on some ice cold milk!! 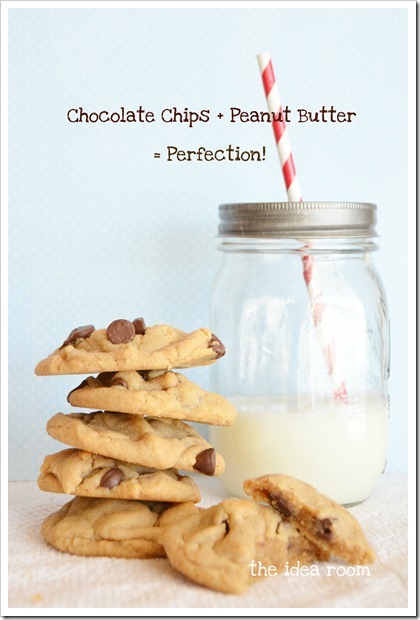 Do you prefer a little Peanut Butter with your cookie? 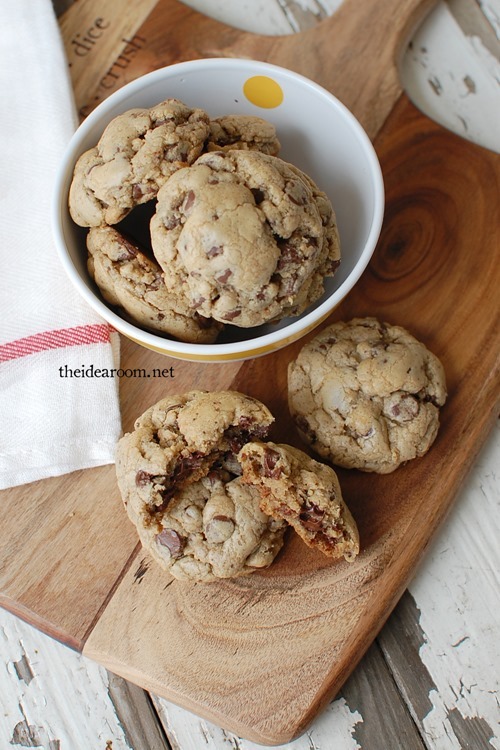 Maybe our favorite Peanut Butter Chocolate Chip Cookie is more your style. Heavens…there is enough love to go around…how about both? Check out alldayidreamaboutfood.com. 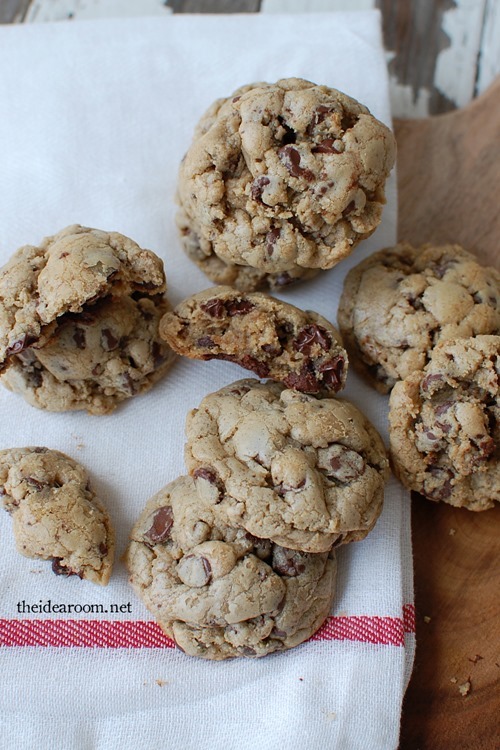 She has lots of gluten free and low carb recipes, and yep, chocolate chip cookies too!! These look great! I challenge you to a cookie throwdown! Mwuah ha ha. These are my FAVORITE! Best recipe ever. I do, however, like them much better with milk chocolate chips! To each their own :) Any type of chocolate will do!! I have tried that one…maybe I need to try the Land O Lakes and your suggestions!! And the part about the vanilla ice cream? Pure genius right there my friend! And Pecans! We use walnuts sometimes but I really prefer pecans…double genius!! I totally hear you! This job is hazardous! Good for you! I think I’ll give these a try! They look mouth-watering… Although, I’m trying to eat less sweets, my teenage son wouldn’t have any problem cleaning out the cookie jar. 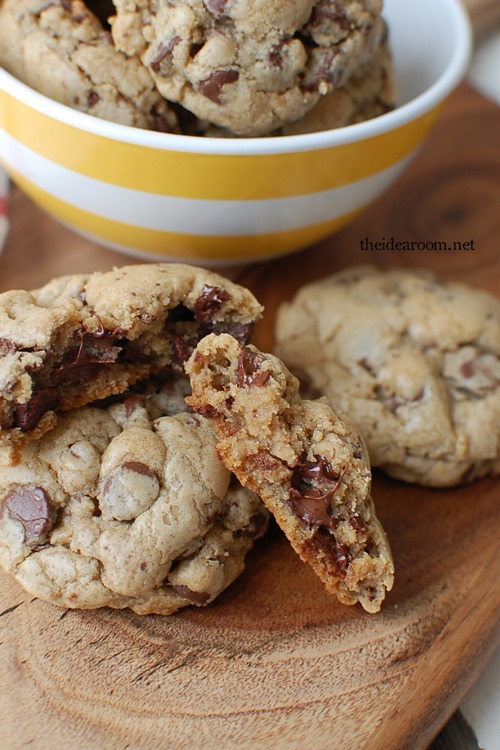 : ) I would use Ghirardelli Baking Chips. I tried them once and there’s no going back. They are so chocolaty and creamy. 12 minutes. Maybe it’s just my oven. Thanks for sharing the recipe! Made this recipe this morning. It was just ok. I will stick to the Nestle Toll House Recipe. So much better. I also think that the temp should be 375 not 350 as indicated. Mine were not even close to being done at 350 but cooked when I turned it up to 375. Glad I tried but won’t make again. I made these just now and they came out nothing like the photos :-/ they were thin and crispy which fortunately I like but it wasn’t what I expected or wanted given I was baking to share with friends, family, and coworkers (aka I was aiming for a cookie that would be universally liked – I know not everyone is into the thin and crispy.) I did follow the recipe exactly, except I put my oven to 375 as per recommendation by another commenter, but I found after 8 minutes they were getting pretty toasty so I took them out. Glad you have a favorite recipe. Ya! Must be differences in ovens. Use Crisco Baking Sticks: butter flavor, instead of butter!!! doesnt make them flat! Crisco helps them keep there full shape!! These cookies are sooo amazing! Though they are delicious and creamy, I had to work at the dough with a mixer for almost half an hour to get it into a dough consistency. Finally, I added a little whole milk, and it turned out great!! I made these today, followed recipe and oven temp and they were perfect and like the photo at 10-11 min. Very good. I had to work a bit at the dough as it is dense. Thank you! So glad you like them! Yes…the dough can be quite dense. I sometimes will add a tiny bit of milk to make the dough a little more pliable if needed. I didn’t have vanilla pudding but chocolate. Oh my gosh that with 2 cups of chips definitely fulfills my chocolate needs! So good. Can you please confirm what baking soda is? Is it Bicarb of soda or is it baking powder? Not baking powder. The bicarb of soda! Tried many gluten free chocolate chip cookie dough. Your had a little grit to it. Otherwise baked good. You need to let them cool a good 2 minutes before taking them off the cookie sheet. Very soft cookie like you would get from a regular cookie. Where is the recipe? I’m on an iPhone and I don’t see it anywhere. Help! Your site (along with thousands of others) has a WordPress error – your shortcode is not working, and your recipe has disappeared. My recipe is close to this one. I’m going to try your version. I do use different instant puddings. I have used coconut, butterscotch, lemon, french vanilla. You will have to let me know if you like this recipe. I just love them! Instead of using butter, its so much better to use Crisco Baking Sticks, butter flavor. Butter spreads, and goes flat, but Crisco helps the cookie keep its shape. I’ve been using this recipe for decades. My family won’t eat any others. Try it with chocolate pudding mix instead of vanilla, they are wonderful.